Static electricity is an everyday phenomenon - there can be few of us who have not experienced a static shock after walking across a room and touching the doorknob, or on getting out of a car. Other static nuisance effects include the clinging of some fabrics to the body, the sticking of a plastic document cover, or the attraction of dust to a TV or computer screen. Static electricity also helps parts of our everyday life by its applications: photocopying, painting, pulverisation, de-dusting, etc. Directly related to the atomic structure of the materials used or treated in industry, it is created spontaneously, under certain conditions, during operations of manufacture or handling. Static electricity can build up rapidly on objects, in unexpected ways, to produce surprisingly high voltages. This directive adopted on May 17, 2006 replaces directive 98/37/EC of June 22, 1998. Static electricity Machinery must be designed and constructed to prevent or limit the build-up of potentially dangerous electrostatic charges and/or be fitted with a discharging system. Explosion Machinery must be designed and constructed in such a way as to avoid any risk of explosion posed by the machinery itself or by gases, liquids, dust, vapours or other substances produced or used by the machinery. Machinery must comply, as far as the risk of explosion due to its use in a potentially explosive atmosphere is concerned, with the provisions of the specific Community Directives. The electric material used in these machines must in addition be in conformity with the specific directives into force with regard to the risks of explosion. Adopted 23 the Mars 1994, it applies as well to the electric as non-electric equipment intended to be used in all the types of explosive atmospheres (gas, vapour, fogs, dust). Adopted on December 21, 1992, it specifies the procedures for the conformity assessment and the essential health and safety requirements applicable to all the individual protection equipment for professional use, sports, DIY and leisure. One specific requirement ( EHSR 2.6 ) is dealing with PPE for use in explosive atmospheres. ATEX DIRECTIVE 1999/92/CE concerning the protection of workers likely to be exposed to the risk of explosive atmospheres. This directive adopted on 16 December 1999, lays down minimum requirements for the safety and health protection of workers potentially at risk from explosive atmospheres and in particular the obligations of employers. In this directive adopted on 30 November 1989, applicable to work equipment in use at workplaces, a general minimum requirement related to risk of explosion is laid down. 2.18. All work equipment must be appropriate for preventing the risk of explosion of the work equipment or of substances produced, used or stored in the work equipment. The way of an efficient prevention of the risks is to integrate safety at the earliest stage of design of equipment and installations . There isn’t a standardised unique solution but several possible solutions which can be separately or simultaneously applied according to the identified risks and to the characteristics of the installation. In addition to these measures of technical nature, information and training actions to the risks due to static electricity and its control, constitute also an essential step of prevention. General issues: The use of antistatic personal protective equipment is advisable where risks cannot be adequately controlled by other means which are equally or more effective, or in addition to organisational and technical measures. – Provide to workers PPE appropriate for the risks involved, without itself leading to any increased risk and shall – Provide PPE in compliance with the relevant provisions of the Directive89/686/EEC on the design of PPE in particular with the Essential Heath and Safety Requirement 2.6 related to PPE for use in explosive atmospheres, – Ensure its good working order and satisfactory hygienic condition by means of the necessary maintenance, repair and replacements. Several European standards on PPE having antistatic properties (shoes, gloves, clothing) have been already published. They contain measurement methods to assess their electric resistance other terms their capacity to eliminate, dissipate electrostatic charges. Limit values for surface resistance and vertical resistance between 10 8 and 10 11 ohms are generally required in these standards, which is appropriate to cover all ATEX situations (gas, vapour and dust). An other induction charging method is proposed to assess the charge decay (migration of charge across or through a material leading to a reduction of charge density or surface potential at the point where the charge was deposited) and the shielding factor ( related to the electric field strength). – EN 1149 “Protective clothing. Electrostatic properties”: Part 1: 2006 Test method for measurement of surface resistivity, (Supersedes EN 1149-1:1995) This European Standard specifies a measurement method of the surface resistivity of materials intended to be used in the manufacturing of electrostatic dissipative protective clothing (or gloves) to avoid incendiary discharge. This test method is not applicable for materials to be used in the manufacturing of protection clothing or gloves against mains voltages. Part 2: 1997 Test method for measurement of the electrical resistance through a material (vertical resistance) This European Standard specifies a test method for measuring the electrical vertical resistance for materials intended to be used in the manufacturing of protective clothing. This test method is not applicable for materials to be used in the manufacturing of protection clothing or gloves against mains voltages. Part 3: 2004 Test methods for measurement of charge decay This European Standard specifies methods for measuring the dissipation of electrostatic charge from the surface of materials for garments. The test methods are applicable to all materials, including homogeneous materials and inhomogeneous materials with surface conducting fibres and core conducting fibres. Part 5: Performance requirements (prEN under approval) This draft European Standard specifies requirements for electrostatic dissipative protective clothing to avoid incendiary discharges. The requirements may not be sufficient in oxygen enriched flammable atmospheres. This draft standard is not applicable for protection against mains voltages. – EN 420:2003 – protective gloves – General requirements and test methods According to clause 4.5 of this standard the electrostatic properties shall be tested according to the test method described in EN 1149-1 or EN 1149-2 or prEN 1149-3. Electrostatic pictograms shall not be used for this property. In this standards ist is stated that these tests are designed for garments and have not been validated for gloves. Some interlaboratory trials have shown significant discrepancies in test results for the triboelectric charging method ( method 1 of EN 1149 part3). It is thus essential to give comprehensive information about the test parameters used along with any test result. “Antistatic footwear should be used if it is necessary to minimise electrostatic build-up by dissipating electrostatic charges, thus avoiding the risk of spark ignition of, for example flammable substances and vapours, and if the risk of electric shock from any electrical apparatus or live parts has not been completely eliminated. It should be noted, however, that antistatic footwear cannot guarantee an adequate protection against electric shock as it introduces only a resistance between foot and floor. If the risk of electric shock has not been completely eliminated, additional measures to avoid this risk are essential. 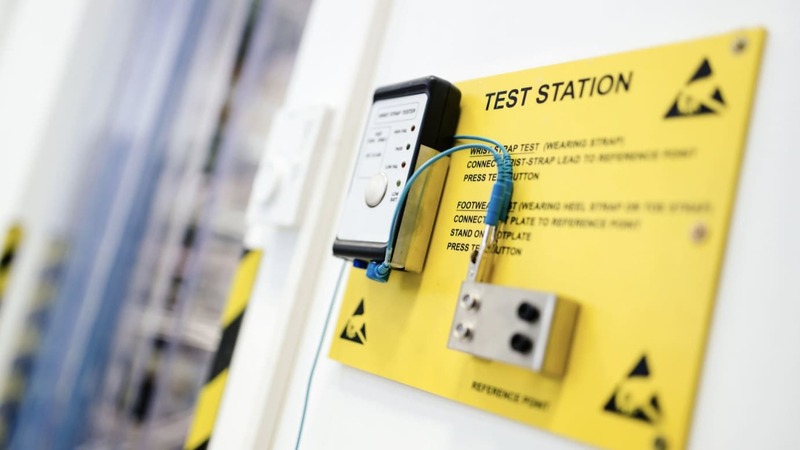 Such measures, as well as the additional tests mentioned below, should be a routine part of the accident prevention programme at the workplace. Experience has shown that, for antistatic purposes, the discharge path through a product should normally have an electrical resistance of less than 1000m2 at any time throughout its useful life. A value of 100k2 is specified as the lowest limit of resistance of a product when new, in order to ensure some limited protection against dangerous electric shock or ignition in the event of any electrical apparatus becoming defective when operating at voltages of up to 250V. However, under certain conditions, users should be aware that the footwear might give inadequate protection and additional provisions to protect the wearer should be taken at all times. The electrical resistance of this type of footwear can be changed significantly by flexing, contamination or moisture. This footwear will not perform its intended function if worn in wet conditions. It is, therefore, necessary to ensure that the product is capable of fulfilling its designed function of dissipating electrostatic charges and also of giving some protection during the whole of its life. The user is recommended to establish an in-house test for electrical resistance and use it at regular and frequent intervals. Classification I footwear can absorb moisture if worn for prolonged periods and in moist and wet conditions can become conductive. If the footwear is worn in conditions where the soling material becomes contaminated, wearers should always check the electrical properties of the footwear before entering a hazard area. Where antistatic footwear is in use, the resistance of the flooring should be such that it does not invalidate the protection provided by the footwear. In use, no insulating elements, with the exception of normal hose, should be introduced between the inner sole of the footwear and the foot of the wearer. If any insert is put between the inner sole and the foot, the combination footwear/insert should be checked for its electrical properties”. Use of working clothing in potentially explosive atmospheres: Antistatic shoes and clothes must be used. The floor must also be antistatic otherwise the wear of antistatic shoes is useless. Underwear or warm clothing made of insulating synthetic fibres could be used as far as workers do not remove them in the explosive atmosphere zone. In addition to the risks of fire and explosion, static electricity may provoke nuisances both for workers and manufacturing processes. If the nuisance for workers is not dangerous in itself due to the weak energies involved (some millijoules), it can become painful by its repetition and even have very serious consequences by effect of surprise (e.g. falls from ladder). Most people do not feel an ElectroStatic Discharge shock unless they are charged to over 4000 V (the sensitivity threshold varies between people, and even over parts of the body). This phenomenon of discharge is related to the accumulation of charges by the persons themselves by friction on the ground and on the seats, in particular in very dry weather conditions. – the energy transported by an electrostatic discharge or the corresponding electromagnetic field can damage electronic components or produce dysfunction of electronic or data processing materials. Indeed, current electronic components (ex : MOS) are very sensitive to static electricity; electrostatic discharges of very weak energy can deteriorate them. – The electronics components may also be disturbed; electrostatic discharges being able to cause in addition to the deterioration of component, the loss of data-processing data. Requirements related to this type of risk are laid down in the European standard EN 61340-5-1 “Electrostatics. Protection of electronic devices from electrostatic phenomena – General Requirements “ and in User Guide EN 61340-5-2. – another effect of the electric field can be the attraction of dust or particles. This phenomenon may cause problems in the manufacture of the integrated circuits or printing of circuits.